You can thank nostalgia for my choice of book this time. It is an Australian classic, though not one I recall from my childhood. My nostalgia was not for The Bunyip of Berkeley’s Creek, but for another Australian icon: Play School. The show is celebrating its 50th anniversary this year. What memories: John Hamblin, Benita Collings, Noni Hazelhurst, Don Spencer, John Waters. My favourite was Alister Smart, a moustachioed Aussie bloke who reminded me of my Dad. I don’t know what five-year-old me would have made of Tim Minchin. We didn’t get many men who looked like him in a dairy-farming town in the 1980s. Then again, I was obsessed with Carlton and he has long hair like Tommy Alvin and the beard of Robert Walls, so I’d probably have liked him. What I can say with certainty is that Heidi and I enjoyed having Tim read us The Bunyip of Berkeley’s Creek on Play School Celebrity Covers recently. Just a few weeks earlier I had read the story to Heidi, and found myself rather indifferent to it. I got the message, but felt detached from it. But sometimes it’s in the way you tell them, and Tim told it perfectly: a little brooding, a lot of empathy, a certain amount of gravitas. That is one of the delights of Play School’s story time: every storyteller has their own unique style. 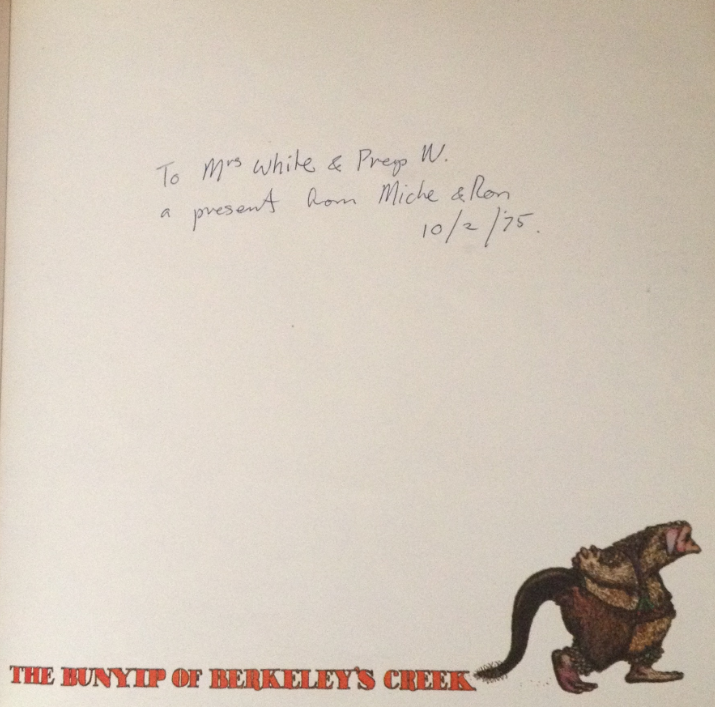 The Bunyip of Berkeley’s Creek is a story of self-discovery, of not being confined by the perceptions of others. In other words, perfect for Tim Minchin. To summarise: a creature emerges from the black mud of a creek. As it scrapes off the mud it asks itself: “What am I?” As quick as Cary Young buzzing in to answer the same question of Tony Barber, a platypus answers: “You are a bunyip”. The bunyip goes around asking other animals what he looks like. “Horrible,” says a wallaby. “Horrible,” says an emu. The bunyip finds a man, a scientist of sorts, who tells him that bunyips don’t look like anything because bunyips simply don’t exist. At first the man doesn’t even look up from his notebook, where a bunyip is existing right there in front of him. But like a typical stubborn human being, the man knows what he knows, and won’t be told otherwise. But the bunyip remains cheerfully optimistic. He goes off someplace quiet where he can be as handsome as he likes, on his own, away from those who will only bring him down. He looks at himself with a little mirror – an obvious metaphor for finding oneself instead of relying on the opinions of others – and seems happy enough. He’s even happier when a lady bunyip emerges from the swamp, and he shares his mirror with her. Though it wasn’t familiar to me, The Bunyip of Berkeley’s Creek was a collaboration between the same author and illustrator who created one of my childhood favourites: John Brown, Rose and the Midnight Cat. Author Jenny Wagner wrote the story, with all its existential angst, and illustrator Ron Brooks added his earthy style, creating an atmosphere distinctly Australian but not clichéd. As a result, the book feels timeless. And yet it was very much of a time. Published in 1973, Bunyip came out shortly after the progressive Gough Whitlam was elected Australia’s new prime minister, ending 23 years of conservative rule. The bunyip’s “What am I?” refrain struck a chord with Brooks, who sensed the entire country collectively asking a similar question. As a result, the tall and imposing Whitlam was one of the models Brooks used to design his bunyip. The other was a fascinating individual named Haworth Bartram. You’re unlikely to have heard of Haworth Bartram, so let me fill you in. His name was familiar to me from researching an upcoming blog entry on a curious Australian book called Monty Mouse Looks for Adventure. What makes it so peculiar is that the illustrations are not drawings but photographs – photographs of a taxidermied mouse posed in various ways to fit the story. Haworth Bartram was the photographer. Not only that, he was the publisher. A very wealthy former importer who never married and lived with his elderly mother in Heidelberg, Bartram was a keen photographer who believed that illustrating books with drawings was old-fashioned, and photos were the way of the future. So he started a photography studio/publishing company called Childerset, more or less to produce his own work. Well over six feet tall, with a large equatorial circumference, he resembled nothing so much as a balloon, one of those pear-shaped water balloons you drop from the verandah roof onto some unsuspecting little brother or sister ... Not much neck to speak of ... And because he had no waist, he wore braces – over the shoulders, crossed at the back and clipped to his pants to hold them up. Haworth Bartram sounds like a very odd individual indeed – Brooks describes the way he rarely saw Bartram consume anything other than Arnott’s Scotch Finger biscuits and bottles of orange Fanta. And much as I would like to see a photo of him, the only one I can find online is a grainy digitised newspaper picture of him as a young boy. Further googling reveals that he died in 1985 at the age of 62. But Brooks’ description of him sounds very much like the bunyip star of our book – although because Brooks was nervous about making his bunyip too much like Bartram, he threw in a little bit of Whitlam as well. In any case, the end result was a character that has charmed generations of Australian children. As an illustrator, Brooks certainly has a characteristic style, featuring lots of cross-hatching and linework to create the appearance of texture. And as an author, Wagner too is distinctive, dealing with questions of existence, identity and prejudice, and layering her work with symbolism that adults might understand, while children will just enjoy a good story. Symbolism features heavily in John Brown, Rose and the Midnight Cat, which will also appear on DadReads in the future. It remains a childhood favourite of mine – like Play School. 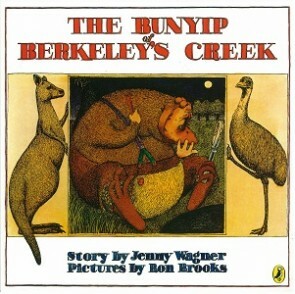 For me, The Bunyip of Berkeley’s Creek is in a different category, but I can understand why those who read it as children may love it. And I’m prepared to have it on medium rotation for Heidi’s story time. A personal post-script to finish: my mother-in-law (Heidi’s grandmother Margaret) knew Ron Brooks back in the 1970s, when they lived near each other in Warrandyte in Melbourne’s outer north-east. Margaret was a Prep teacher at Warrandyte Primary School and had in her class Ron’s step-daughter Miche; Ron would often come in for story-time with the children. Here is the inscription from a copy of The Bunyip of Berkeley’s Creek gifted to Margaret by Ron, 41 years ago.